Why Buy A Snow Cone Machine? Snow cones – the time-honored treat of crushed ice flavored with fruit syrup, offer the perfect party accessory. While snow cones – and their adult equivalent, the sorbet – can be made by hand, it's a lot less time-and-labor consuming to invest in a snow cone maker. Because you're not just making snow cones – you're helping your children make memories – and that's priceless. Snow cone makers are a great addition to parties, and a fun, safe way to keep children occupied. As they come in a range of designs, you're almost certain to find one that blends perfectly with your kitchen decor. 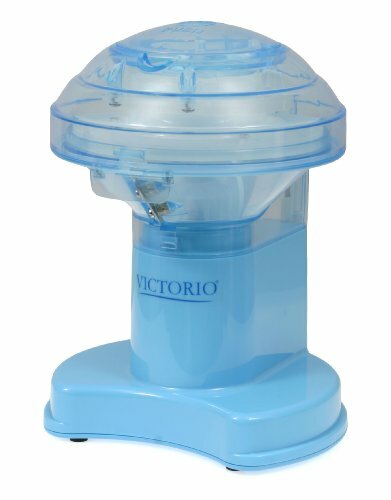 You don't need to spend a lot of money to get a good quality, safe, reliable snow cone machine that will produce tasty, fun iced treats, and, with a range of suitable toppings readily available, you can make sure your children are enjoying healthy, low-sugar treat options. Many snow cone makers are stylishly designed, and so won't look awkward on your counter-tops, but will still steal the show at parties. They're also not just for kids – what adult doesn't like to take time out for a while, and remember the simple pleasures of childhood? In a cute vintage design guaranteed to evoke memories of childhood fairgrounds, the Nostalgia SCM502 Vintage Collection is ideal for long summers, and great for small, occasional events. It is perfect for home use, at parties and family gatherings, but professional capability requires professional investment. Featuring stainless-steel cutting blades, a built in safety switch, and including an ice scoop, and two reusable plastic cups, the Nostalgia can make up to twenty 8oz snow cones. It will definitely keep the party going whilst not compromising on safety. The Nostalgia is a counter-top model, offering stylish, space-saving convenience; the only real draw back noted is that it can be a little loud when in operation – but nobody minds a little extra noise if it adds to the fun of a party or get-together – just turn up the music, and you won't notice the sound of snow cones being turned out. 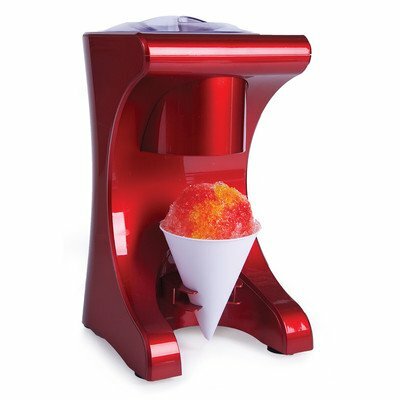 If you're not too fussy about the precise texture of your snow cone, and you're not looking to spend big bucks, then the Hawaiian Shaved Ice S700 is perfect for a bit of family snow cone fun. 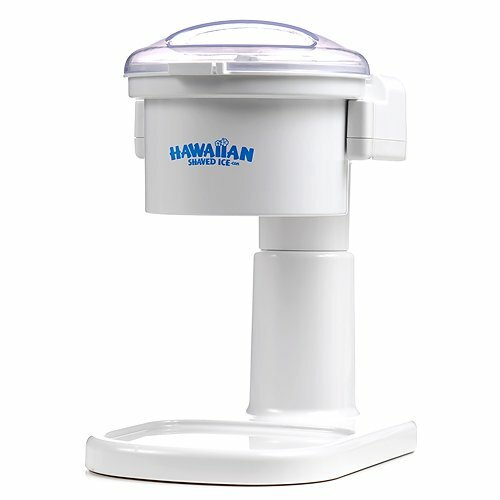 Designed to be easy to use, and child-safe, the Hawaiian has received some criticism for not producing smooth, fine-textured ice chips, but, in general, the sentiment is that slightly coarser textured snow cones still taste just fine. All in all, the Hawaiian offers affordable, easy-to use, safe, convenient family fun, and has a range of branded accessories available to purchase separately. This machine has a transparent lid, so that young (and not so young!) snow cone enthusiasts can watch the action as it happens, and offers adjustable, replaceable stainless steel blades for easy cleaning. For added convenience, it also allows you to use regular ice cubes – many machines require specifically-molded cubes in order to produce a fine consistency snow cone. 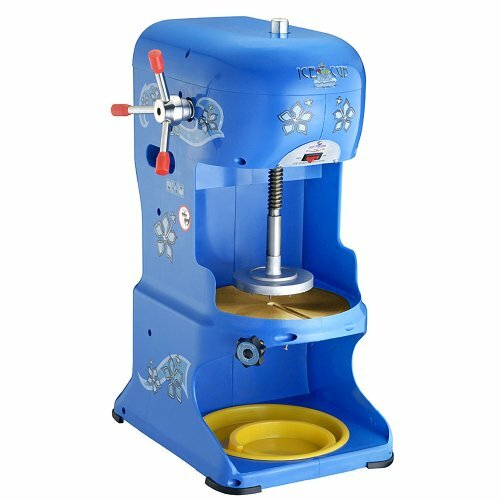 With its bright plastic colors, the Time For Treats machine isn't going to blend seamlessly into your kitchen decor, but, if you're more concerned about fun and function than style, this machine is ideal. If it's premium quality you're after, then you can't do much better than the Great Northern Premium Ice Cub Ice Shaver, which comes with a heavy-duty, commercial standard motor, which means you get top-quality, snow-like shaved ice in minutes. This machine also includes a safety shield, and comes with adjustable, replaceable stainless steel blades. Its brass and stainless steel construction makes it durable and solid, although it has been suggested that the motor may be a little too powerful for the machine body, leading to a little bit of vibration when in operation. It is also important to note that, while the MOTOR is a commercial grade motor, this machine is not intended for commercial use – though it would probably suit someone running a refreshment stall at small-scale seasonal or neighborhood events. Finally, Holstein Houseware's HU-09018R-M offers stainless steel blades and detachable parts for easy cleaning, along with a lid locking mechanism for added safety. Designed in an attractive, stylish and sophisticated metallic red, the Holstein is definitely the most stylish snow cone maker out there, and would fit in will with any kitchen theme. It comes with four reusable plastic cups, and is ready to go – just add ice, and top off with a light fruit syrup, or fresh pineapple slices. A snow cone machine is not a frivolous expense. You might hear people say they’re suitable only for a limited time each year, and likely to sit around collecting dust after a couple of uses. But they are actually a godsend for parents of children with allergies. Commercial snow cone stands often have a variety of ingredients in the same area, with a lot of potential for trace transfer, meaning that children with peanut allergies, for example, often have to miss out when their friends are being treated to snow cones. 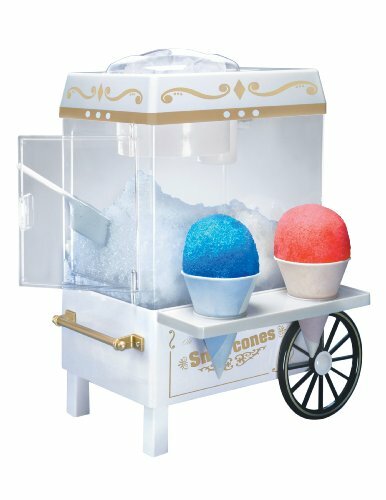 With a household snow cone maker, however, that doesn't need to be the case, as you can control what toppings and flavorings are used, and easily cater to allergies, intolerances and preferences, meaning no child has to miss out on the cool, refreshing fun of snow cones because of an allergy risk.